We have too many peace-propagandists among us who cunningly skew our reality and dodge discussion of the ramifications of their recommendations. Degani is one and he is influential beyond his pro forma position. In this quintessential encapsulation of left-wing conceit, Degani professed to know instantly and smugly who to blame for loutish manifestations on our society’s margins. By the criteria of his pedagogic omniscience, everything untoward – from teen rowdies disrupting the Cameri Theater’s performance of Ghetto to football hooliganism – emanates from “occupation.” Regardless of sanctimonious linguistic obfuscation, the ultimate logic of Degani’s analysis leads to the denigration of Jewish self-defense. According to Degani’s facile outline, everything is neatly black and white, with no complexities, subtleties or suggestions of soft shading. Israel is the villainous ogre and the Arabs under its hobnailed boot are the randomly terrorized victims. It’s a simplistic formula sure to impress juvenile minds placed under Degani’s charge. Therein lies the danger of his crude, one-dimensional distortion. There’s no depth, no background, no history, no whys and wherefores, no hint of justification for anything. It’s sloganism at its shallowest. Degani gives voice to anti-Israel propaganda, even though he’s sure to indignantly deny this. He teaches his susceptible pupils to see Israel as its enemies portray it. In our region that’s a recipe for self-destruction no matter how ornately and pretentiously garnished with human-rights palaver. Yet worse than the affectation of virtue, is the plain fact that Degani is wrong (or perhaps demagogically misleading). Disrespectful and disorderly behavior in our midst doesn’t arise from those segments of Israel’s population of whom Degani most disapproves. There’s no infestation of oafish and boorish outcroppings where ideology, tradition and values are high on the scale of priorities. The thugs who couldn’t contain themselves at the theater didn’t come from the national-religious school system, for instance. But a disproportionate number of volunteers for IDF combat officers’ training and for crack commando units do hail from that environment. Fewer and fewer come from the milieu favored by Degani. The results of Degani-like indoctrination aren’t difficult to detect. In one Tel Aviv school ceremony, around the time of Degani’s barring of the officers, students adamantly refused to sing the lyrics to “I Have No Other Country.” Their ties to this country are by inference tenuous and conditional. Tel Aviv’s educational institutions have descended very far from those of the city’s visionary beginnings and subsequent trailblazing. Tel Aviv sprang up around Gymnasia Herzliya. Its building was the first public structure erected in 1909 on the shifting sands that would become the first Zionist urban creation. The Gymnasia was Tel Aviv’s central hub. It was founded four years earlier in Jaffa, dedicated to the premise that all subjects can be taught in Hebrew. It served for decades as a magnet for Jewish youth and as the embodiment of Zionist fervor. But as per the old adage, it appears sadly that Gymnasia Herzliya’s old age shames its youth. One would have assumed that given the unique circumstances of its birth, this school’s successive stewards would be particularly cognizant of the historic duty entrusted temporarily in their hands. Instead of posturing as postmodern guardians of other people’s consciences, they ought to remember that the only reason Gymnasia Herzliya ever took off from its ultra-humble beginnings was an insatiable hunger for Jewish nationalism, as distinct from today’s universalist zeitgeist. Dr. Yehuda-Leib Metman-Cohen and his wife, Fania, founded the school in their own narrow two-room flat off a winding dark and dank alley near today’s Clock Tower in Turkish-ruled Jaffa. Following the then-predominant European pattern, their secondary school accepted pupils aged nine to 19 and offered a nine-year program. Fania, the author of the country’s first-ever Hebrew arithmetic textbook, taught math while stirring the pots in her makeshift kitchenette and peeling onions. After class, both husband and wife washed down the floors each day. It took nerve and verve to forge ahead with an all-Hebrew curriculum when no modern teaching material existed in Hebrew. Everything had to be fashioned from scratch. 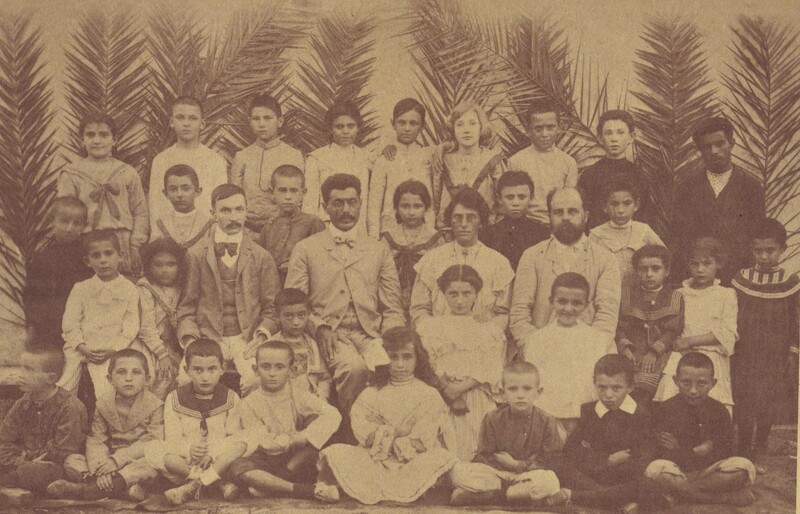 “There was an ecstasy of creativity and pioneering that gripped both children and teachers,” recalled the late Dr. Baruch Ben-Yehuda who was enrolled in the school in 1906 and stayed with it for most of his life, studying there, teaching, becoming an inspiring principal and then president. I interviewed him in 1975, when Gymnasia Herzliya celebrated its 70th birthday. “Everything we did was revolutionary and we were flushed with the importance of our every accomplishment. Our kids roamed the length and breadth of the county, venturing to neglected far-flung corners to form a bond with Israel’s past and present. This school stood in the vanguard of the Jewish national revival and partook in all our national battles. If Mikve Yisrael epitomized the tie with land, Herzliya epitomized the tie with our nationhood and culture,” Ben-Yehuda argued. He went on: “There’s no major Zionist ideological movement whose activity cannot be traced to Gymnasia Herzliya. Our students also figured in the practical side of the Zionist endeavor. They guarded Tel Aviv when the Ottoman Turks expelled all its residents in WWI. Our students and graduates – like Eliyahu Golomb and Dov Hoz – were among the founders and driving forces of the Hagana. Many in this school took part in Lehi and IZL underground struggles. Our alumni underpinned Israel’s independence and self-defense. The then-novel passion for Hebrew appears to have nowadays been replaced with a penchant for Orwellian Newspeak, produced prodigiously by Israeli Doublethinkers. Their misuse of the word “occupation” inculcates in the listener’s ear the notion that Israelis willfully, with no provocation, crossed the blessed Green Line one sunny June morning in 1967, snuffled out Palestinian sovereignty (nonexistent though it was) and sadistically subjugated the ancient Palestinian nation (invented only lately). Heaven forefend we mention that the territory in question isn’t foreign but directly contiguous to our incredibly narrow-waisted state – an integral part of our ancestral homeland – yet we hadn’t taken it until forced to defend ourselves against attempted genocide and ethnic cleansing. The prattle in latter-day Gymnasia Herzliya about how “occupation corrupts” advocates relinquishment by Israel of its deterrent potential, making instead do with containing would-be annihilators and reacting to their initiatives. Yet by not utilizing the capabilities we possess, by not opting for decisive victories and by acquiescing to prolonged conflicts of attrition, we embolden our implacable foes to introduce deadlier means and escalate terror. Half-hearted responses invigorate enemy resolve and increase noncombatant casualties and suffering. That was Orwell’s observation precisely. Despots, he concluded, “can stand ‘moral force’ till the cows come home; what they fear is physical force.” Ramallah’s and Gaza’s death-mongers fear physical force. They want Israelis to flee. Israelis who preach withdrawal and protest intermittent IDF actions, help fulfill the enemy’s wishes. Degani and fellow holier-than-thou peace-pontificators are our present-day counterparts to the antiwar activists of Orwell’s day. It’s beyond comprehension, how a tool like Degani is allowed to poison minds of our children. “Only in Israel” comes to mind. Maybe Degani should just look over his shoulder, where Arab peacenik Basher Assad slaughters his fellow countrymen and women and children…maybe as a direct result of Israels gruesome occupation of the Golan ? Madmen like him, who have given up on Zionism are the biggest gift to Israels leftist enemies around the world…Germanys anti-Israel “Der Spiegel” LOVES the ones like Tom Segev for example…these people are doing harm to Israels Hasbara in an unimaginable way !!! THEY ARE VERY, VERY DANGEROUS !!!!!!!!!! “because of the cowardice of all American presidents since the ovethrow of the Shah…” You paint American presidents with a very broad brush. Excuse me, Ronald Reagan wasn’t a coward. Your dead god Ronnie R. came to the rescue of Yasser Arafat in 1982 after the IDF had his ugly head in their sniper cross hairs and gave him safe passage from Beirut to Tunisia and it’s been all downhill for Israel since hitching their wagon to the infernal empire and her dubious and backstabbing presidents. Is it any wonder why Israel is in such a mess ? “Orwell was intrigued by the “psychological processes by which pacifists who started out with an alleged horror of violence end up with a marked tendency to be fascinated by the success and power of Nazism.”” – A general fascination of the Left with power and “successful” tyrannies (today with Cuba and Venezuela) is to be understood in the context of its obsession with utopian ideology. In order to create the New, Perfect Man this ideology requires to destroy all old traditional structures. Those experiments with humanity it can conduct only if it has total power, i.e. dictatorship of the Left. HOW can anyone in Israel be so deranged, to accept the foul language of the Antisemites in regard to the misuse of the word “occupation” ? That misuse is the key for the deligitimation of Zionism and the Jewish state per se ! The political fight to overcome ones enemies, has to start with the rejection of the enemy propaganda ! The left masquerade lack of spine by attacking the right. The right cannot attack back, it can only get weakened by the constant attrition… Great article! Thanks. the thought that one generation after the establishement of הגמנסיה העברית in Tel-Aviv – Everything in Israel worked in Hebrew. Todah raba for this great, and in a real sense, terrible article on Gymnasia Herzliya. The decline in patriotic spirit that Ms. Honig chronicles, mirrors the decline in patriotic spirit in America, because of something called “multiculturalism.” Multiculturalism white-washes the worst in other cultures and religions; and ceaselessly distorts and denigrates the contributions that America has achieved, and given to the world. Multiculturalism thereby gives rise to moral relativism, and the mistaken perception that all cultures are equal. While all people should be treated as equals, all cultures, in many respects, are NOT equal. And moral relativism is a great obstacle to solving our problems. To Marcel: Reagan wasn’t God, and obviously he made a big mistake when he let Arafat off the hook. Men of conscience sometimes give terrorists a reprieve, when they shouldn’t; there are many examples of this, and American Presidents aren’t the only ones who are guilty. Yitzhak Rabin at Oslo also made this mistake; I believe.